Chronic weight gain or an inability to lose weight is often attributed to a caloric excess where energy intake from food exceeds energy expenditure from physical activity and metabolic rate. A recent study in the journal Obesity found that 2 groups of overweight and obese women experienced dramatically different levels of weight loss simply by structuring when they ate most of their calories. This happened despite both groups eating the same number of calories from the exact same meals. Circadian rhythms exert powerful control over our metabolism via many mechanisms and are likely the drivers of the difference seen in this study. One important way circadian rhythms can cause major metabolic disturbances is through something called leaky gut. The intestinal barrier is comprised of a single layer of epithelial cells charged with the responsibility of keeping larger molecules in the gut from entering the circulation and wreaking havoc with our health. When the barrier fails, metabolic dysregulation ensues. People are becoming more familiar with the ways that a leaky gut can cause chronic inflammation. A primary driver of this chronic inflammation is the molecule lipopolysaccharide(LPS). When LPS enters the circulation, it causes an immune response that leads to high levels of inflammation. This not only changes the way we feel and our susceptibility to inflammatory conditions, it also changes the way our body processes the food we eat. As a result, we are more prone to excess weight gain and less likely to lose excess weight. In this blog we’ll cover the details of the study in Obesity and discuss how it’s an important illustration of how circadian disruption and leaky gut can alter our physiology in a way that promotes poor health and disease. According to the National Health and Nutrition Examination Survey from 2009/2010, 2 out of 3 American adults are either overweight or obese(1), a number that’s expected to climb. Depending on who you ask, the reason Americans are becoming overweight is either from increased calorie consumption, decreased physical activity, or a combination of both. It’s been emphatically stated and repeatedly shown in the literature that the primary driver of weight gain in humans is a positive energy balance. Energy balance is the difference between calories consumed and calories burned. A positive energy balance occurs when calorie consumption exceeds calorie burn. Conversely, weight loss can only happen in a negative energy balance, where calorie burn exceeds calorie consumption. I don’t think there’s really any argument against this notion, but most would have you believe that it’s simple and straightforward. It’s not. You’ve more than likely heard the statement, “A calorie is a calorie.” In a general sense this is true, a calorie is a calorie. However, I don’t think most people care whether a calorie is a calorie because it’s mostly useless information. Why, you may ask? Because a calorie is defined as the approximate amount of energy needed to raise the temperature of a gram of water by 1 degree Celsius at a pressure of one atmosphere. Now ask yourself, do you really care about that? What you may be more inclined to ask is whether eating your meals at different times of the day has a differential impact on your ability to lose weight. Based on a study from 2013, the answer appears to be yes. And this data is backed by animal models(2) as well as epidemiological studies in humans(3). The mechanisms behind the difference have also been previously reviewed(4). In the study, published in the journal Obesity, researchers followed 93 overweight and obese women between the ages of 20-65 for 12 weeks. The women consumed 1400 calories per day with 46 eating half of their calories at breakfast and 47 eating half their calories at dinner. Lunch was held constant at 500 calories. The composition of both diets was identical, they simply flipped what was eaten for breakfast and dinner. The participants were sedentary to start the study and told to maintain their activity level and report any change. At the end of the study, 38 women remained in the breakfast group and 36 remained in the dinner group. There were a number of significant differences between the 2 groups, the most striking being the average weight loss. The average weight loss for women in the higher calorie dinner group was 8 lbs while the average weight loss in the higher calorie breakfast group was 19lbs(5). For those keeping track of energy balance, the difference between the 2 groups was roughly 458 calories per day, despite eating the exact same diet. So this effectively indicates that, while a calorie is a calorie, those calories are processed completely differently depending on the time of day they’re consumed. We can get a little more insight by looking at the other results from the study. Metabolic dysregulation due to circadian disruption? While there’s no doubt that an 8lbs weight loss is nothing to sneeze at given most people’s inability to lose meaningful amounts of weight, other metabolic parameters measured in the study tell why the dinner group lost less weight. In the breakfast group, triglycerides dropped from 179mg/dl to 119mg/dl while they actually increased from 178mg/dl to 204mg/dl in the dinner group. Triglycerides are a measure of how much fat the body is making. Typically this is due to excess calories, but since caloric intake from both groups was the same this indicates that the calories were being processed differently depending on when they were eaten. Other interesting results centered around blood glucose and insulin. In the breakfast group, fasting glucose, fasting insulin, and HOMA-IR(A measure of insulin resistance) improved by 11.5%, 51%, and 57%, respectively. In the dinner group, they improved by 4.2%, 29%, and 32.5 %. The differences between the 2 groups are large enough to suspect that perhaps the dinner group may not have been as compliant as they stated or the breakfast group hopped on over to their local Crossfit and didn’t bother reporting it. However, these same measures of metabolic health are disturbed in animal models of circadian disruption. They’re also identified as the mechanisms linking circadian disruption to obesity in human epidemiological studies. This brings up an important question…Are the effects of this study circadian in nature? Circadian rhythms are variations in biological processes that follow a 24 hour pattern. Circadian rhythms exert strong control over human metabolism and are regulated by environmental cues called zeitgebers, or timegivers. There are multiple zeitgebers, but one of the more potent zeitgebers and one that has strong control over our metabolism is the feeding/fasting cycle. Insulin and blood glucose both follow a circadian rhythm due to a peripheral clock located in the pancreas(6) and this clock is set by the feeding/fasting cycle. This will have an impact on how food is processed depending on when it’s consumed. In this study, the breakfast group actually started off more insulin resistant than the dinner group and saw greater improvements after 12 weeks, to the point they had less insulin resistance than the dinner group at the end. This indicates that a bigger meal may be more appropriate during the morning, when insulin sensitivity is highest. Gut health also may play a big role. I recently covered the role circadian rhythms play in gut health in a blog you can find here. In this blog, I covered how circadian rhythms help regulate intestinal permeability, a fancy name for leaky gut. This is the key to understanding how the results of this study came about and a primary way that circadian disruption causes metabolic dysregulation. In mice, circadian disruption leads to greater intestinal permeability, aka leaky gut(7). It’s important to note that in this mouse study circadian disruption was induced by altering light exposure rather than the feeding schedule. However, circadian regulation of leaky gut is regulated by both light exposure and the feeding/fasting cycle(8). 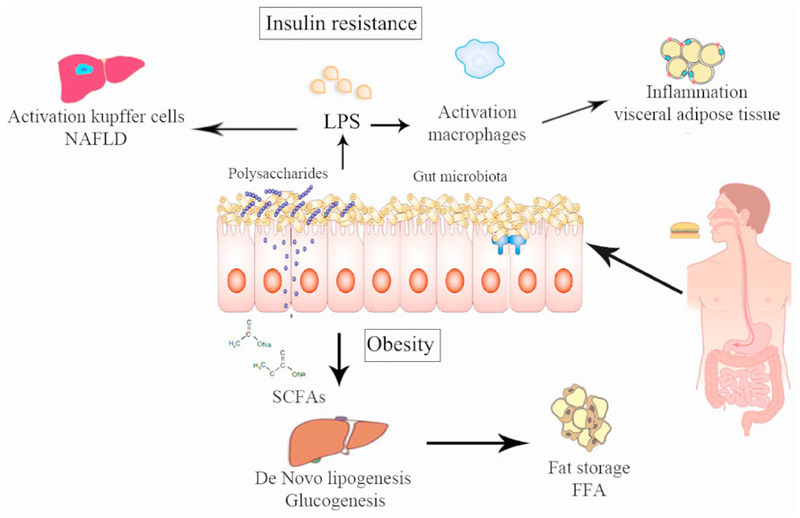 The consequences of a leaky gut are pretty much inline with the results of this study: Metabolic dysregulation due to insulin resistance. But how does the insulin resistance develop? Leaky gut is problematic from a metabolic perspective due to an increase in systemic inflammation. When the gut becomes “leaky”, bacteria that reside there are able to gain access to the bloodstream. This isn’t good because a component of the cell wall of certain bacteria called lipopolysaccharide(LPS) induces this inflammation. This same process happens during sepsis, although to a much greater extent. The amount of LPS leaking in to the blood during sepsis is life threatening, but the effects are much more mild during leaky gut. Rather than being deadly, the amount of LPS entering the blood during leaky gut simply disrupts metabolism by causing insulin resistance. Since LPS is also called endotoxin, this process is called metabolic endotoxemia. It’s important to note that in the mouse study, circadian disruption primarily affected the permeability of the colon. Since the colon contains the vast majority of bacteria in the gut, this leads to “high” levels of LPS in the blood. “High” enough to cause metabolic dysregulation, but not high enough to induce sepsis. Although, it’s important to note that circadian disruption due to light exposure led to similar levels of leaky gut as alcohol consumption, which itself disrupts circadian rhythms(9). Studies in humans confirm the association between blood levels of LPS and insulin resistance. Circulating LPS levels are higher in Type 2 diabetics than healthy controls(10, 11). A recent review covering all of the data also indicates that metabolic endotoxemia is a relevant factor in obesity in humans(12). Finally, another study took a look at meal frequency and metabolic endotoxemia in lean and obese women. The food for the day was exactly the same between the 2 groups, but it was either broken in to 2 meals or 5. Endotoxin levels were higher in the obese subjects than the lean subjects, and were higher for both groups in the 5 meal vs 2 meal condition(13). Of particular interest to the Obesity study is that fasting triglyceride levels correlated to endotoxin levels in both lean and obese women. The group who ate a larger dinner actually saw an increase in triglycerides which could indicate greater levels of endotoxemia. Unfortunately, they didn’t directly measure serum enodotoxin levels in this study so there’s no real way of knowing how much, or even if, leaky gut and endotoxemia played a role here. Based on this other data, there’s a pretty good chance it played some role, but one can only speculate. What is clear from all this data is that meal size and frequency are important factors in determining how the food you eat is metabolized, even when calories are held constant. Who do these results apply to? The results of the Obesity study seem to illustrate how harnessing the power of circadian rhythms can be powerful in regulating metabolism and gut health. What’s clear from the study is that structuring your calorie load to earlier in the day may promote greater weight loss than when most calories are consumed at night, holding total calories constant. This is interesting because most people, at least in the United States, tend to eat their biggest meal at dinner. Some people don’t even bother eating breakfast. These results don’t apply to people with Type 2 diabetes. The study protocol specifically excluded people being treated for Type 2 diabetes due to interference effects with medications on study outcomes. Baseline results of the study showed fasting blood glucose levels in both groups to be withing normal limits, so applying this data to Type 2 diabetics is not appropriate. While manipulating meal timing provided a benefit to overweight and obese people without patholoical metabolic dysregulation, a more thorough approach to circadian alignment is necessary for those with Type 2 diabetes. This includes manipulating other zeitgebers such as body temperature, light exposure, and physical activity/exercise. This deeper approach to circadian alignment is also necessary for those with gut disorders. People with gut disorders were was excluded from the study due to large meals and meal contents promoting symptom flares that would affect dietary compliance. There are some interesting takeaways from this Obesity study showing calories consumed at different times differentially affect weight loss. First, while a calorie is a calorie, calories consumed at different times of the day impact metabolism in different ways due to circadian variation in insulin and blood glucose regulation. In this study, the difference between consuming more calories at breakfast vs dinner was equivalent to decreasing caloric intake by 458 calories per day. This is roughly 33% of the total daily calories consumed. That’s huge. Second, the improvements seen in the women eating a larger breakfast are indicative of reversing the damaging effects of metabolic endotoxemia without overt Type 2 diabetes. Over 3 months, most women would much rather lose 19lbs than 8 lbs. The greater weight loss in women eating a larger breakfast in this study indicates that metabolic endotoxemia may play a role in preventing weight loss, even without Type 2 diabetes. Finally, the results of this study indicate that circadian factors, specifically the feeding/fasting cycle, may play a big role in weight management in obese but metabolically healthy women. This may be due to the circadian variation in insulin/blood glucose as well as improvements in leaky gut and metabolic endotoxemia. On paper, the feeding/fasting cycle between the 2 groups in this study are identical. However, it’s important to note how circadian rhythms work from an eating perspective. First, the peripheral clocks start with first consumption and end when nutrients are no longer present. In both groups, the first meal was taken at 8am. But when the last meal is large, nutrients are available for a longer period of time so the start of the subjective fasting window is delayed. More importantly, the peripheral clocks entrain to the largest meal(14). A larger breakfast is more inline with our physiology since we are diurnal creatures. This would lead to better alignment between the peripheral clocks and the master clock, which is entrained by light. Thus, both the length of the fasting window as well as food volume interact to set feeding/fasting effects on circadian rhythms. Overall, the data seems to suggest that paying attention to variables that determine circadian rhythms may have a profound effect on our ability to lose weight. This effect is likely due to the way zeitgebers help regulate metabolism and leaky gut. Hey, haven’t noticed that happening yet. Could be because I am in such a small niche area, but it may be happening without me knowing it. Not sure there’s much you can do about it.